Picked up my Bretton/Cannon pass yesterday to start my season. It was -3 degrees when I pulled into the Bretton Woods parking lot; cold enough where you can feel you nose hairs freezing when you take a breath. Nice and sunny though. Coverage is good at BW, but they seem to be short staffed and have only opened a handful of trails. The natural snow is deep enough that they could be almost 100% open. All the roped off trails had tantalizing untouched powder. The open trails were still good, but most of the powder is used up. The base is firm, but there was plenty of loose stuff on top so it made for good skiing. 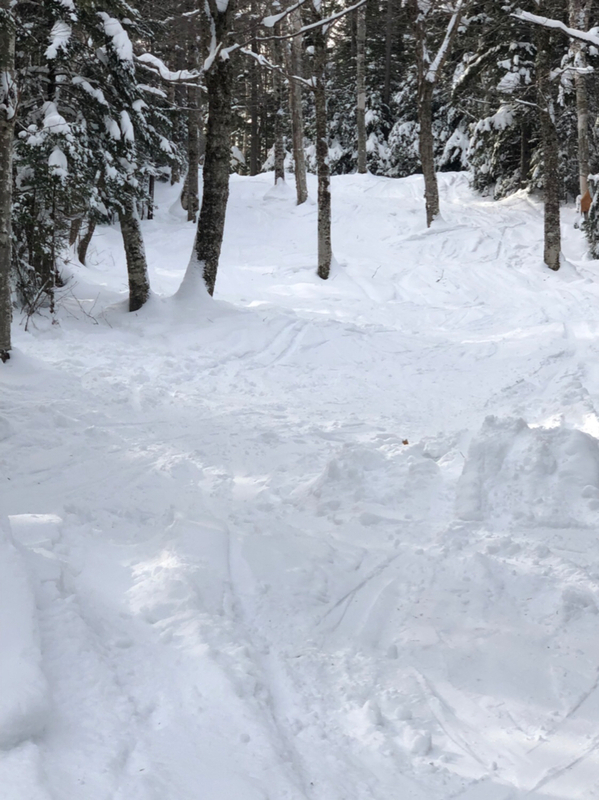 About half of the open trails were groomed and the other half were left natural, so you could find some bumps on the natural trails. I was curious to check out the progress on the new Gondola. The base terminal looks pretty much done except for the platform. None of the towers are in yet and they are just sitting in a lower parking lot. The base terminal is quite huge, and almost seems out of proportion to the lodge, kind of like parking a school bus in your driveway. It's hard to see the top terminal of the Gondola, but you can just glimpse it from the Bethlehem lift at the point where the lifts will crossover. It's the little square thing in the middle of the picture below. It looks like most of the top terminal is done from what I could see. The foundations for the lift towers are really far apart, so I think the towers are going to be really tall. Here's a pic of some bumps and whales. They had some snowmaking going on, but mostly just on Bigger Ben, so they aren't being very aggressive about expansion. They weren't very crowded, so probably they aren't in much of a hurry to open a lot of terrain yet. I skied all the trails that were open, and my legs were reminding me that they have a long way to go before they get into ski shape. After lunch I headed over to Cannon since it was their opening day. Conditions at Cannon were much worse, so I was wishing I had stayed at Bretton. Seems like Cannon had some kind of thaw and refreeze event, so the powder was partially changed into crusty ice. The crowd was much bigger too, so most of the trails were scraped down to rock hard boilerplate. The upper mountain didn't appear to be open, but they had a lot of snowmaking going on up there. Mittersill wasn't open either, so the crowd was confined to the lower main mountain. I did about four runs at Cannon and called it a day. I still had some energy left in my legs, but didn't want to overdo it the first day out. Felt good to be back on skis. Conflicting stories on this from another forum regarding cannon. Might be early day vs late day. Last edited by dlague; Nov 24, 2018 at 9:34 AM. If you take what the mountain gives you, you will always have fun! Conflicting stories on this from another forum regarding cannon. Glade West at BW was great today! I agree, seems like a lot more ropes could have been dropped. Especially West Mountain, and I also wonder if it was a staffing issue. Lift lines were Saturday in February-long by 11 am today. All times are GMT -5. The time now is 2:16 PM.